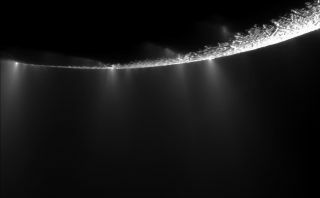 In 2005, NASA’s Cassini spacecraft discovered that geysers blast water ice, organic molecules and other material into space from the south polar region of the Saturn moon Enceladus. NASA's Cassini spacecraft has made its deepest dive yet through the plume emanating from the south pole of Saturn's icy moon Enceladus. Cassini checked in with its handlers a few hours after the encounter, providing a general status and health update. The first flyby photos won't be released until Thursday night (Oct. 29) or Friday (Oct. 30) at the earliest, while initial analyses of plume particles will likely take a week or so, mission team members have said. So keep checking back with Space.com to see what the close encounter — the 21st Enceladus flyby Cassini has performed since arriving in the Saturn system in 2004 — ends up revealing.